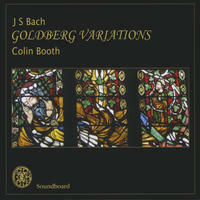 Colin Booth : JS Bach Goldberg Variations. Johann Sebastian Bach's Goldberg Variations are one of the greatest items of the keyboard repertoire. They are often recorded, but less often played live. Their technical difficulty has been a challenge to which innumerable harpsichordists and pianists have risen. But the underlying wit and humour of this amazing work has sometimes been disguised by sheer virtuosity. Again, many have approached the Goldberg Variations in a 20th century spirit of undue reverence and solemnity, at least in the view of Colin Booth. Colin's recording is deeply felt, but more than most performances, also shows the good-naturedness of J. S. Bach, and presents the detailed counterpoint which is the basis of the composition, with unusual clarity. You can really hear how the music is made. In addition to being a personal account, this album demonstrates some of the discoveries made by Colin during the decade during which he not only worked at this piece, but was writing his in-depth study of Baroque notation: "Did Bach Really Mean That?" Both book and album emphasise often-overlooked elements in Bach's music: for example, the great man was a dancer in his spare time, and his music is imbued with dance-rhythm, another feature often left unrevealed in present-day performance. License Solo harpsichord music by Colin Booth for your project. Play the music of Colin Booth in your restaurant or store.